Erect, North Carolina is an unincorporated community in Randolph County, North Carolina, United States, and part of the Piedmont Triad metropolitan region. 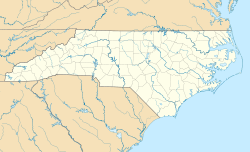 Erect is located on NC 42, seven miles east of the North Carolina Zoo in Asheboro, and two miles west of Coleridge. Erect was founded in the 18th century by German and English settlers, along with the nearby communities of Steeds, Sophia, Whynot, Hemp, and Lonely. Many of these settlers were known for their pottery-making skills. A post office called Erect was established in 1883, and remained in operation until it was discontinued in 1935. In 1889, Erect had a population of 39 inhabitants. The 15-square mile (30 km²) region surrounding the town of Seagrove, twelve miles to the southeast, is known as the "Pottery Capital of North Carolina." Erect is located in the vicinity of the "North Carolina Pottery Highway", a collection of approximately 100 potteries and galleries along NC 705 in Randolph and Moore counties. Goss Lake, Goss Lake Dam, and the Lambert Mill Dam are located in the Erect quad. ^ a b "Erect (Randolph County, North Carolina)". Geographic Names Information System. United States Geological Survey. Retrieved 2008-06-17. ^ Ridpath, John (1897). "The Standard American Encyclopedia of Arts, Sciences, History, Biography, Geography, Statistics, and General Knowledge". Encyclopedia Publishing Company, Harvard University: 3172. ^ Brown, Charlotte (2006). The Remarkable Potters of Seagrove: The Folk Pottery of a Legendary. Sterling Publishing. p. 13. ISBN 1-57990-634-6. ^ "Randolph County". Jim Forte Postal History. Archived from the original on 14 April 2015. Retrieved 14 April 2015. ^ Branson's North Carolina Business Directory ... L. Branson. 1889. p. 539. ^ Scheid, Jenny (2005-09-04). "Seagrove, N.C.: Pottery Yarns". Las Vegas Review-Journal. Retrieved 2008-06-17. ^ Cissna, Bill (2005-05-15). "Follow 'Pottery Highway' into Carolina haven steeped in clay". The Atlanta Journal-Constitution. Retrieved 2008-06-17. ^ "Seagrove, NC- The Little Town That Could". Carolina Arts. Retrieved 2008-06-17. ^ "Feature Detail Report - Goss Lake". Geographic Names Information System. Retrieved 2008-06-17. ^ "Feature Detail Report - Goss Lake Dam". Geographic Names Information System. Retrieved 2008-06-17. ^ "Feature Detail Report - Lambert Mill Dam". Geographic Names Information System. Retrieved 2008-06-17.